Not everyone has the skills and steadfastness to be a tower climber, but for those who are drawn by the salary and adrenaline, tower climbing staffing agencies can be a great way to get a foot in the door. 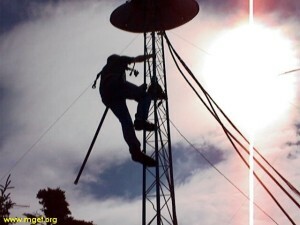 The official title these jobs are listed will be Radio Frequency Tower Climber, Radio Tower Climber or simply Tower Climber. These jobs are available throughout the United States and all over the world. It helps if applicants have experience or a degree in a field related to mechanics or any sort of electrical field. Staffing agencies also look for people who have experience in sales, operations, sales management, and ownership of service or product related industries. The salary of these positions greatly depends on the demand and location someone is working in. It is not a safe assumption that larger companies necessarily pay more. Most staffing agencies work with hundreds of non-profit, business, advertising, and marketing firms. Some of the positions are short-term and others are long-term which may develop into permanent positions. Overseeing the daily operation at sites. Filling out the required paperwork for sites and crew. Ensuring the quality and safety requirements are met for both the job and crew. Compiling all the lockout documentation. Following the detailed instructions provided by the Project Manager. It is also important to have good people skills in order to maintain relationships with co-workers and customer service representatives, as well as to properly coordinate all prospective areas within these groups. Strong leadership skills are important to train new employees but, it is also important to listen to the details and instructions of others who are more knowledgeable. The candidate should have knowledge of all antenna systems equipment including cable, connectors, TMA’s, antenna, grounding, weather-proofing and all of the associated hardware. A willingness to work any shift and overtime. Ability to read, write, and speak in English. Authorized to work in the respective country. Willing to travel if necessary. Working in this field can be demanding and the margin for error is nil. Companies look for only the best of the best candidates in a variety of fields. Many companies offer classes in safe climbing and emergency rescue to ensure that their climbers are prepared for the best and the worst case scenarios. Pick your Tower Climbing Staffing Companies carefully.